Amazing Hedge Puzzle01600 890360work Theme ParkThe Amazing Hedge Puzzle is just right for playing games with your friends and family, like hide and seek, tag, or even Kiss Chase! Will you rely on agility or stealth? 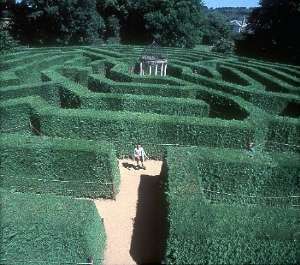 The Museum of Mazes will surprise you - its hands on fun. Think you know how to solve mazes? Think again. A thousand years ago theywere solved by reading and geometry. Fantastic puzzles are available in our shop - and more. Will today be the day you pick up your first unicycle, or start to juggle? It's your chance to take home some puzzling fun and share it with your friends. Educational visits and calendar of special events. The Amazing Hedge Puzzle is just right for playing games with your friends and family, like hide and seek, tag, or even Kiss Chase! Will you rely on agility or stealth?